he simplest types with short carbon chains are monosaccharide or ugars. Monosaccharide tastes sweet. Monosaccharides are the building blocks f more complex carbohydrate molecules. Four common monosaccharides in nimals are glucose, fructose, glyceraldehydes, and dihydroxyacetone. (i) Sucrose (table sugar): It is a disaccharide formed by linking a molecule of glucose to a molecule of fructose. 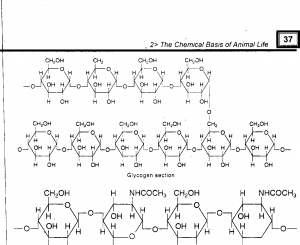 (ii) Lactose: A glucose molecule bonds to another monosaccharide, galactose and it forms disaccharide lactose (commonly called milk sugar). (iii) Maltose: It is formed by the joining of glucose subunits. It gives beer seeds a sweet taste. Beer brewers ferment barley into alcohol. Many monosaccharides joined to form polysaccharides. 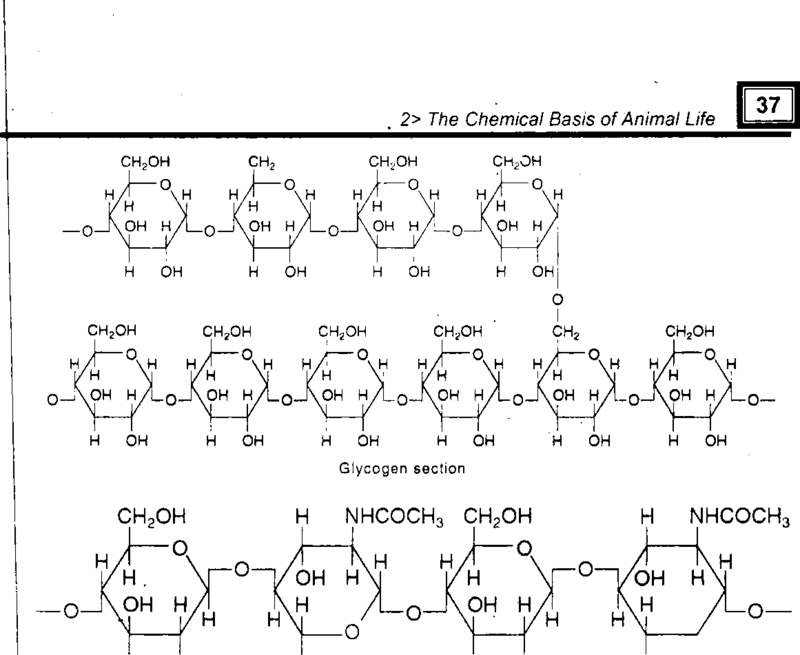 (i) Glycogen: It is a major storage compound in animals. The number of glucose units within the glycogen molecule varies. Thus it is symbolized by the formula (C6H1005),, . The n is equal to the number of glucose units in the molecule. (ii) Chitin: It is a major component of the exoskeleton of insects and crustaceans.